History records the Dambuster Raid of 1943 as an iconic, tide-turning event of the Second World War. 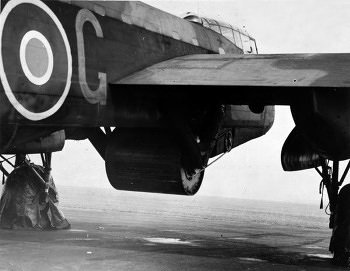 Accomplished by 617 Squadron, a cosmopolitan team of specialist low fliers, the audacious low-level attack was critically dependent on high-precision bombing, a precursor to the ‘surgical strike’ tactics of modern warfare. The objective was to strike a disabling blow to the Ruhr region – Germany’s industrial heartland – and its achievement required the invention and innovative deployment of a new weapon, and meticulous preparation of the highest order. What was eventually codenamed ‘Operation Chastise’ first appeared in Air Ministry documents back in 1937, identifying the Ruhr dams as important strategic targets without formulating any specific means of destroying such immense structures. By the early 1940s, Barnes Neville Wallis, then a chief aircraft designer at Vickers Armstrong, had independently approached the Air Ministry with his own plan to bomb the Ruhr Valley dams and cripple Hitler’s capacity to wage war. Barnes Wallis was given access to research facilities and encouraged to pursue his scheme, but it was not until the spring of 1942 that he experimented with ‘bouncing’ bombs. Though this idea will be forever associated with Wallis, gunners aboard 16th-century warships are known to have developed a method of skimming cannon balls across the ocean’s surface to extend their effective range. Realising that his bombs must detonate in contact with the dam wall, Wallis continued to refine his concept, even destroying the disused Nant-y-Gro dam in Mid Wales to gain valuable data. 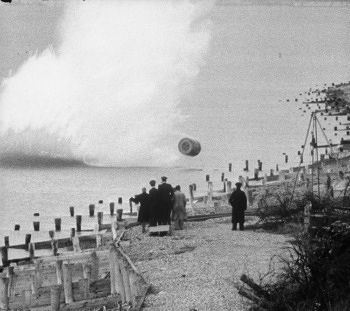 Imparting backspin to a cylindrical mine, weighing over four tons, dropped from a low-flying aircraft was found to be the optimum means of delivering a dambusting bouncing bomb, which would then strike the dam wall and detonate 30ft beneath the surface. Though many important figures – especially Bomber Command supremo Arthur ‘Bomber’ Harris – were sceptical and dismissive about his ambitious plan, Wallis nevertheless secured enough support to gain final approval for his project on 26 February 1943. Having won acceptance, Wallis was now confronted with a major hurdle: the optimum time for a raid on the Ruhr dams was late spring when they would be at their fullest. From his initial full-scale drawing on 27 February 1943, this gave Wallis eleven weeks to realise and execute the project. By mid March, a new RAF Squadron 617 was created under the command of 24-year-old Wing Commander Guy Gibson, and based at RAF Scampton, Lincolnshire. A distinguished pilot, Gibson’s extensive night-mission experience and awards for gallantry made him a natural leader. The remainder of Gibson’s command were an eclectic mix of seasoned veterans, plus some hurriedly drafted airmen and flight engineers with limited combat experience. Assembling the military hardware to resource the Dambusters project at short notice was a daunting task, but British industry proved equal to the challenge. Even though many participants were commercial rivals, collaborative working furnished modified Lancaster bombers, mine casings packed with 6,600 lbs of underwater explosives, and a robust drive mechanism to impart spin to the bombs prior to dispatch. Aircraft and munitions were assembled on schedule, with fifty spinning bombs – each now codenamed ‘Upkeep’ – and suitably adapted Lancasters ready to respond to the call to take to the skies. During the earliest practical experiments, prototypes were launched from Wellington bombers at Chesil Beach. In the next phase, Upkeeps were dropped in trials off the Kent coast. Finally, to mimic the terrain the aircrews would encounter in the Ruhr itself, night training began, and locations such as the dams in Derbyshire’s Peak District began to experience regular trials. Mission training, of course, was surrounded by absolute secrecy, and the Derwent Valley inhabitants endured six weeks of low-level flying, precision bombing practice, and the ceaseless roar of Merlin engines. Lancasters constantly overflew the Ladybower, Derwent and Howden dams as pilots practised in preparation for the Ruhr assault. At first the pilots took a southbound route along the sparkling Derwent, but this was soon altered to a northward flight path which presented a tougher challenge at the tight valley exit. On the night of 16-17 May 1943, 19 Lancasters took off from RAF Scampton bound for the Ruhr. To avoid giving the impression of a major offensive, the aircraft flew in three waves, via three different routes. The primary targets were the Mohne, Eder and Sorpe dams, with the Mohne dam the first to be attacked. Wing Commander Gibson was with the first wave of nine bombers approaching the Mohne. This raid breached the dam with one bomb, then landed another to compound the damage, leading to the rapid flooding of the basin below. Next, the Sorpe dam was targeted and proved very difficult to access. Five second-wave bombers were originally designated to the Sorpe, but only one arrived intact, eventually striking the target on its tenth bombing run without breaching the structure. Later, one third-wave aircraft also scored a hit, again causing damage without effecting a breach. The third dam to be attacked was the Eder. This too proved awkward to access, and only two aircraft managed to launch bombs. The first bomb fell short, but the second was released at a perfect speed and trajectory, exploding against the dam and causing it to rupture and flood the valley below. Of the 19 bombers dispatched, only 8 returned to Scampton. A total of 133 airmen participated in the raid, with 53 losing their lives and 3 captured. During the dark days of 1943, the Dambusters raid was a propaganda coup for the Allies which temporarily crippled Hitler’s war machine. Though the damage was later repaired, it left the Nazi’s Atlantic defences well behind schedule, thus facilitating the 1944 D-Day landings, shortening the war and saving many lives. Completely unaware of the military objective, Derwent Valley locals were not overly impressed with the noise, vibrations, and structural damage caused by low level flight training. Once news of the Dambusters Raid broke however, the villagers were justifiably proud of their wartime role, warmly welcoming film crews returning to record footage at this historic location. Pleasure Flights Ltd offer helicopter pleasure flights along training routes flown by the Dambusters, to book a Dambusters pleasure flight, click here.